I’m referring to the Bang & Olufsen speaker in the photo (the large speaker in front of Rachel). The local Goodwill had a pair for about $45. Currently, the cheapest pair of their speakers goes for about $700. Oh well, all dreams can’t come true. Their size would have overwhelmed my office. (One of my current, and reigning, speakers is shown for scale, next to the B & O speaker and Rachel.) And they would have required some special connectors to work with my computer’s stereo – at the tune of an additional $32. Tell me you at least put them on craigslist and made some money to take Heather out to dinner?!!? Alas, I went the expedient route and took it straight back to the Goodwill. 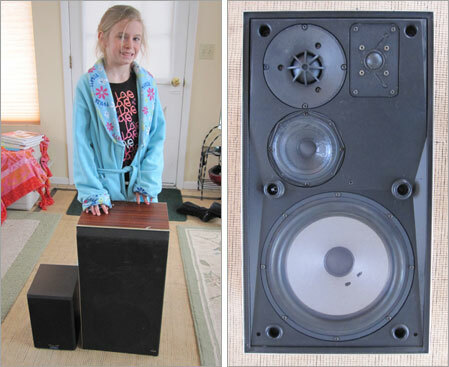 Craigslist might have meant a bit of profit – but it would have undoubtedly meant having the giant speakers somewhere in our house for maybe months. Too bad. B&O makes awesome components. They had really cool nonskipping turntables back in the day. When Harvey and I first got married, I was shocked to find that he had 2 of the hugest speakers I had ever seen (they are 4 feet tall and very expensive I think). My mom was really shocked by them too and she figured I would eventually convince Harvey to get rid of them. But – I don’t even see tham now. However, a couple of years ago I finally got sick of hearing Harvey pining away for a “big TV” and told him to go get one. He came back from the store with a TV that was slightly bigger than the one we had and told me that he had originally bought a larger TV than that, but when they put it in the car it looked so huge that he knew I would hate it and took it back and exchanged it. Go figure.